At breakfast, we met up with the tour group who we had met the previous evening. They were off for a boat trip to Mingun. It was on my list too, but today we planned a day trip to Sagain. Over some boring white toast and stewed fruit, we compared notes on our rooms and sleep quality. Though our room was almost silent, it had been hot and airless, with the air-conditioning only running intermittently. Despite the sweaty conditions, we were well rested. As we left the hotel, Naung Naung (our driver from yesterday) saw us approaching and pulled the car into the driveway. We had already set an itinerary for the day and headed off to battle Mandalay’s nightmare traffic once more. 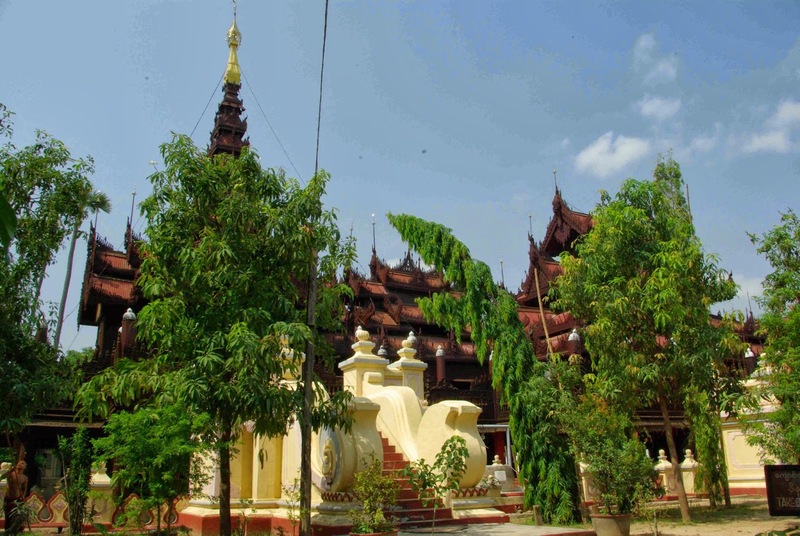 First on my list was the revered Maha Muni pagoda, the most famous in Mandalay. In the same part of the city was Shwe In Bin Kyaung so we stopped there first. 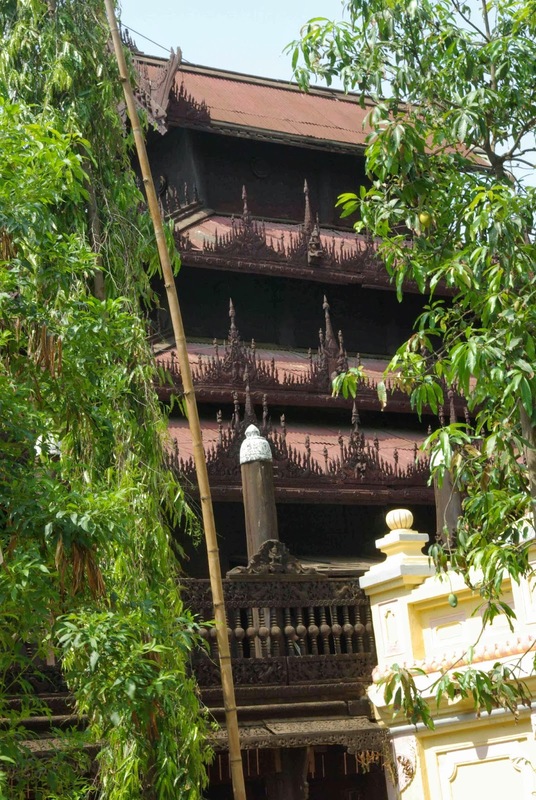 It’s a great teak monastery, not as famous as the Atumashi Kyaung but equally beautiful. Well over 100 years old, it had survived the wars and had a number of monks still in residence. A few monks were picking mangos from the trees that dot the grounds using what looked like overgrown lacrosse sticks. Reaching up using the elongated handle, they positioned the net-like end on the mango’s stalk then sort of swung the pole to detach the fruit. One older monk gestured for us to go in as the younger ones looked at us shyly. 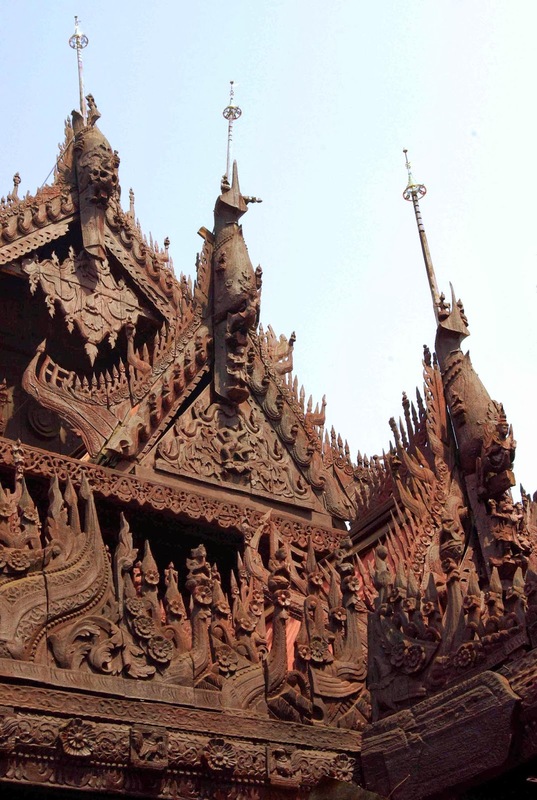 Inside, the rooms contained many wood carvings surrounding a central shrine. The air was hot and stuffy with a pleasant woody smell mingled in with the remnants of a century of incense smoke. A local woman finished her prayers and smiled at us with a warm “Mingalabar”. Once she left, we were the only ones there. Walking around the building, we discovered a few sort-of anti chambers with their own shrines, some covered in spider webs and ancient looking. All with exquisite carvings. The extent and level of detail was astounding. All the doors and door frames were adorned with flowers and (what I guessed to be) Bodhisattvas. Delicate floral patterns and religious figures covered the multi-tiered roof. Only a few minutes away by road was the Maha Muni pagoda. Naung Naung dropped us at a side entrance. “Go. Walk to end”, he gestured. From the outer verandas, we walked into the complex with a long corridor lined with stalls selling souvenirs, tee-shirts, flags, statues, and paintings. But they were not meant for us ‘outside’ tourists; they were for the pilgrims coming here from all parts of Myanmar. Most ‘western’ tourists probably weren’t too interested in theses wares. Not me. 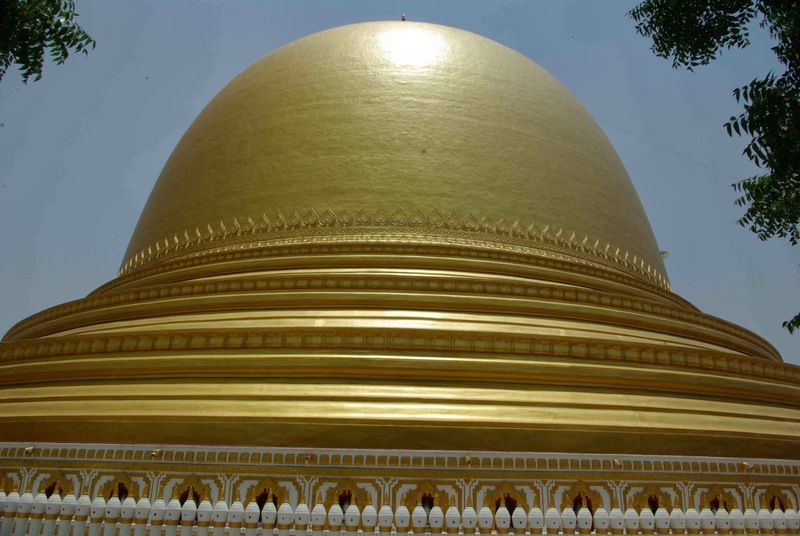 Spending a little too much time browsing, suddenly I found another ‘it’; a perfect match for the other ‘it’ that I had found at another of Myanmar’s sacred sites – the Golden Rock. Yeap, (those of you who have read my other posts may have guessed) a snow dome. At its centre was a little replica of the Maha Muni Buddha image. Gold glitter speckles floated around him as the base lit up displaying all the colours of the rainbow, flashing as they merged from yellow to green to blue then red. Surprisingly, it cost me five times more than my other one, 5000 kyats ($5 US) – outrageous. J was starting to question my mental state, but he managed to drag me from all the stalls, and the hordes of people who continued to drag me into their photos and saying their tentative hellos. Stepping out from the enclosed walkway, we were stopped by some officials to pay a 500 kyats camera fee. 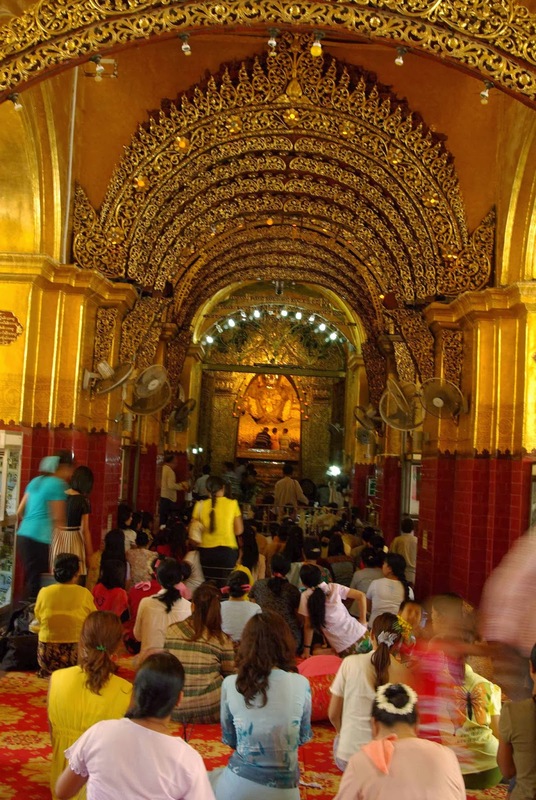 An open walled passage led to the sacred Buddha with masses of people praying and chanting in all directions. Women are not allowed into the inner chamber to place gold leaf onto the statue. Like many sacred sites across the country, only men are allowed right up close and able to touch. Every day, monks wash His face. His lap was covered in over five inches of gold leaf affixed in masses of golden globules so thick it distorted the original statue to the point on non-recognition. I squeezed into the carpeted area before the Buddha to pay my personal respects, much to the amazement of the locals, before shooting off a couple of shots that didn’t work out great. Returning to J, who was pretty much blown away by the by the spectacle, we walked around the interior perimeter where we could see into the inner chamber. Not that we needed to as the proceedings around the Buddha were relayed on many TV screens and beamed live to allow those visitors not able to get right up front to see the sacred face of the Buddha. The Buddha is said to be cast in 554 BC at the time of the historical, actual Buddha’s visit to the northern regions of Myanmar, and believed to be the closest resemblance of his actual face. Around the central temple, a number of pavilions contained many interesting artefacts. White skinned Buddhas were kept behind wire barriers. J jokingly coined them ‘naughty Buddhas’ as they appeared to be locked in some sort of gaol. My guess is that they were very old and valuable, but I couldn’t find any information about them. Of note, six bronzes images were housed in a side temple that date back to the Angkor era. Shiva and Airavata (the three-headed elephant) Hindu deities had been brought to Mandalay along with the Maha Muni Buddha, all originally from the famous Angkor Wat in Cambodia, which had been stolen by Thailand in 1431, and taken again from Rahaing state in 1784 to their current homes. 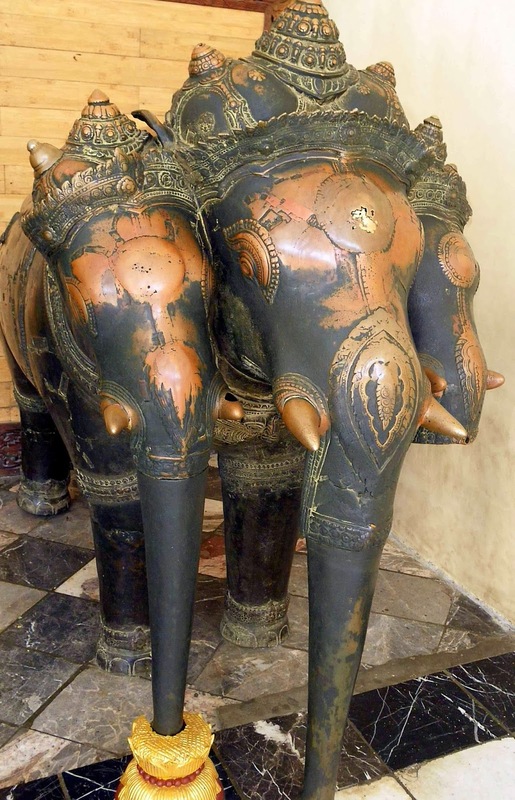 Parishioners rub the statues for luck, resulting in some shiny, bronze patches on the elephants’ heads and the Gods’ hands and faces. Honestly, I could have spent all day there watching the pilgrims, chatting to them, and soaking up the sublime atmosphere. Still, we had many places to see on our day trip and hadn’t even left the city. 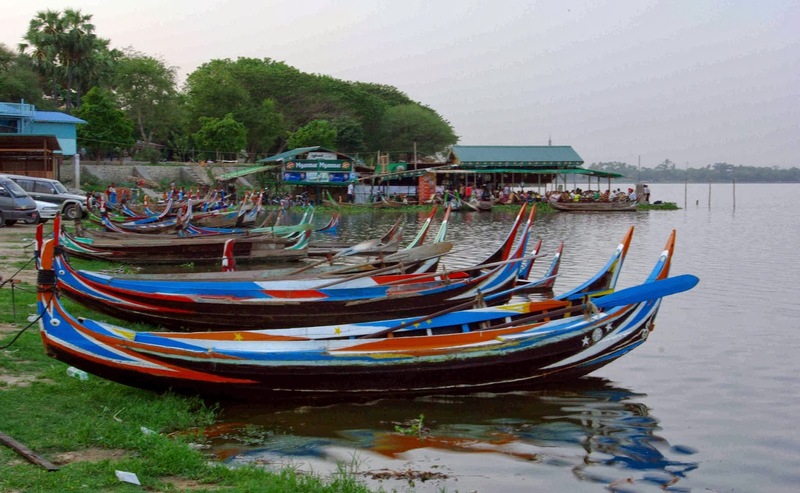 Not far away was the town of Amarapura, where hundreds of looms weave silks and other fibres into detailed designs. Naung Naung asked if were interested, so we stopped at one of many workshops. 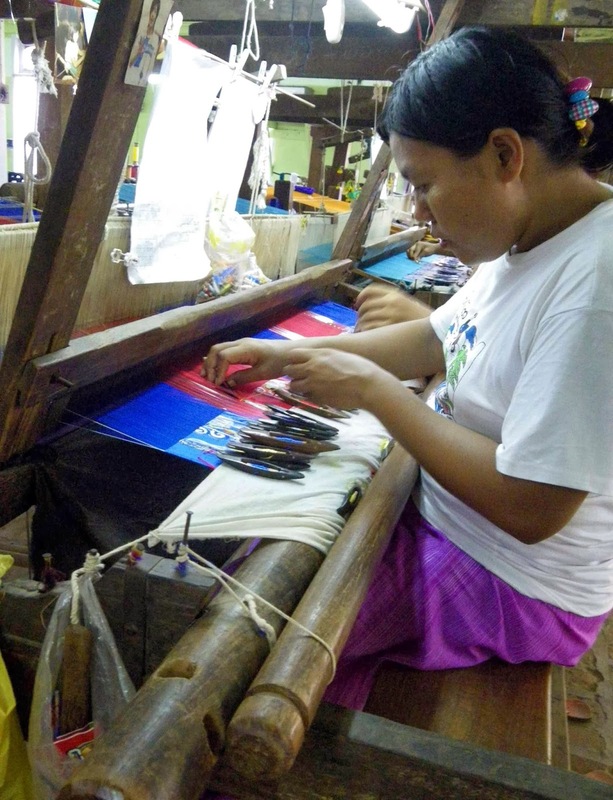 Walking among the devices and the ladies working, we watched them skilfully pressing the pedals of the loom, passing the coloured yarn between the vertical strands as the click-clacked with each pass to form the patterns. One young lady said a tentative ‘hello’, and another smiled, but we were left to walk around alone. I found watching the rhythmic clunking of the machines quite hypnotising. Gulping down a cool drink purchased from a nearby stand, I asked where we could see and / or buy some of the local weaving. Naung Naung called out to an attendant, and we were lead into a spotless shop by a beautiful young lady who spoke a little English. Being the low season, the shop wasn’t kept open all day, just on demand. But it was clearly designed for foreigners with signs in English and modern displays. Selecting some silk scarves, J and I bought presents for each of our mums. A little further down the road was a stunning white pagoda that sees few tourists. Pahto Daw Gyi (or Pahtodawgyi) has the official title of Maha Vijayaramsi, only a few hundred years old. By now, the Myanmar sun was approaching full power and we were thankful for the covered walkways around the stupa. Scenes from the Jataka tales (the stories of the Buddha’s previous lives) were carved into the lower slabs. And elderly monk was circumambulating the shrine, chanting quietly as he walked mindfully. He seemed surprised to see us and gazed at us for a moment, before returning to his meditation. Not wishing to disturb him, or be baked alive in the heat, we returned to the car after only a short visit. 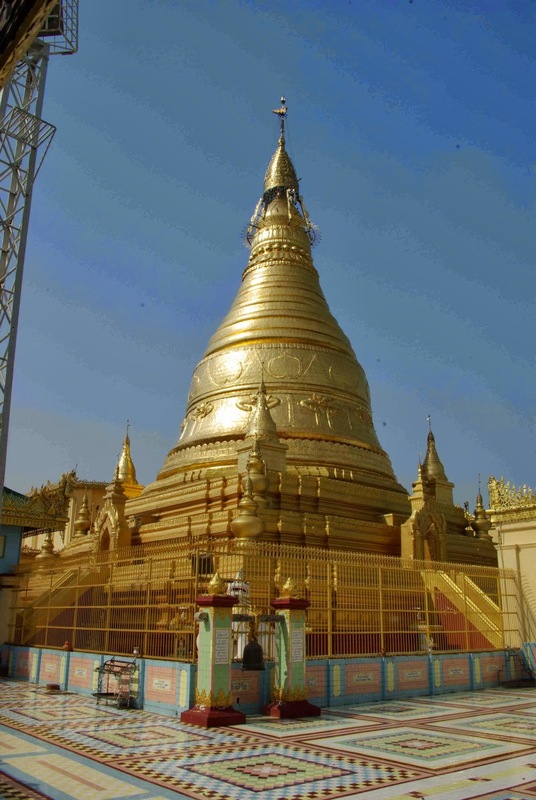 Entering Sagain over the Ayeyarwady (or Yadanabon) bridge, we briefly stopped to admire the domed Kaungmudaw Paya. Until recently, it was painted white to signify its purity, but now its gold gilded. A local legend says that back in 1636, the then king of the region designed it to resemble his wife’s breast. We took a quick walk around it before buying another cold drink and returning to the car. It was incredibly hot! Knowing I was Buddhist and very interested in how the Buddhist tradition is kept alive in various cultures around the world, Naung Naung took us to Sitagu International Buddhist Academy. Walking through the entrance, we discovered it pretty much deserted, its inhabitants probably somewhere cool away from the midday heat. Taken from their web site, the Sitagu Association launched the academy in 1994 to propagate the Three-fold Saddhamma of scriptural study (pariyatti), Buddhist practice (patipatti) and realisation of the Dhamma (pativedha) in the contemporary world. Its intention is to create a world-class modern educational institution to provide training in Buddhist studies and academic subjects to monks, nuns and lay people. 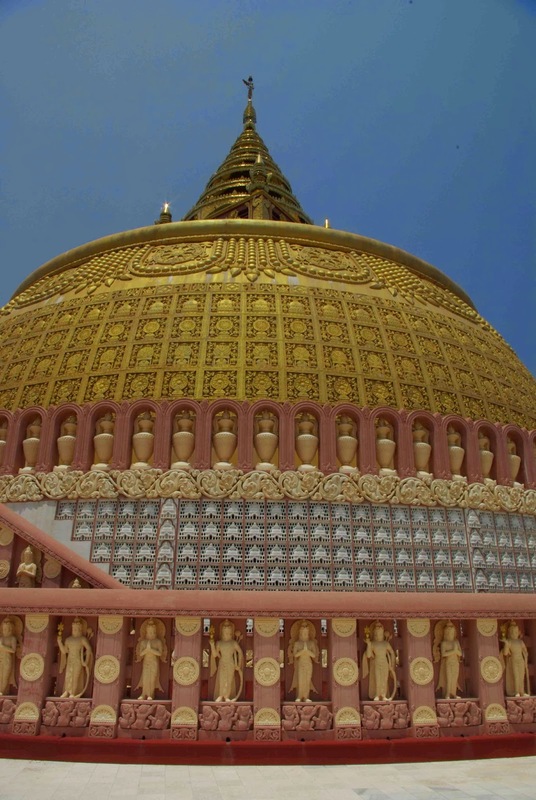 Many buildings stood within the complex, with a central dome paya, similar in size and shape to Kaungmudaw but covered in designs and elaborately adorned with various patterns and sculptures. 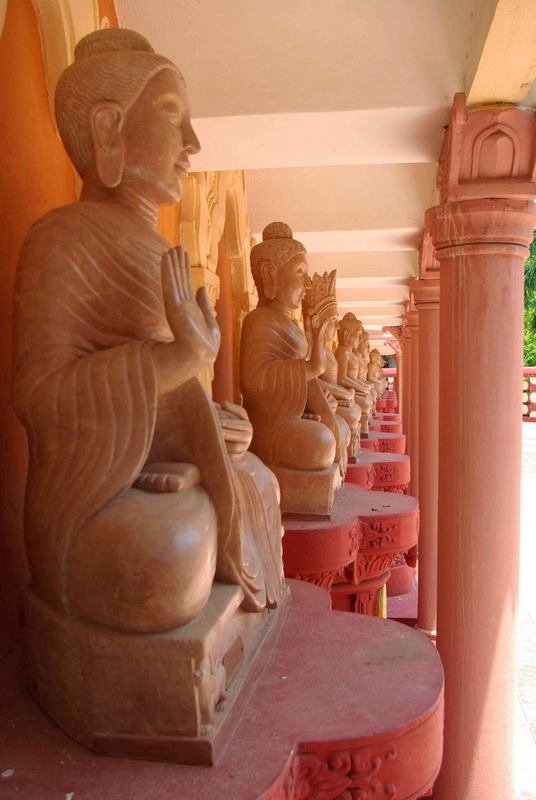 Around the perimeter was a square, covered terrace where dozens of similar but different Buddha statues sat. They were all the same size, and made from the same materials, but each was modelled on a different style or type of Buddha from all the Buddhist traditions and countries from around the world. A plaque before each held information about the originating country, era and mudra (or pose) of the Buddha. Despite the heat, we took our time to examine each and read about their originals, which I found really interesting. Lucky a veranda provided shade from that blazing sun above. Lunch was had at a tourist trap restaurant, clearly intended for us foreigners, and was OK. Fried rice and noodles, served with a lentil broth and cold drinks. When we returned to the car, I asked Naung Naung whether he knew Tilawkagura cave temple. He didn’t. So he headed to the Sagain tourist information centre (or should I say its equivalent) so we could pay the Sagain archaeological zone tourist ticket and ask them. He returned to the car with an older man carrying a torch. “He will show us”, he explained. From the road, the temple and monastery were completely unremarkable and it was not immediately obvious that anything interesting lay beyond. A plain concrete or plaster wall with a few windows and doors stood at the base of a hill. The other man unlocked a heavy iron gate leading inside. He didn’t speak a word of English, but gestured to us to be careful not to bump our heads on the low overhanging rock. Shining the torch into the cave, we were quickly blown away by all the beautiful murals. 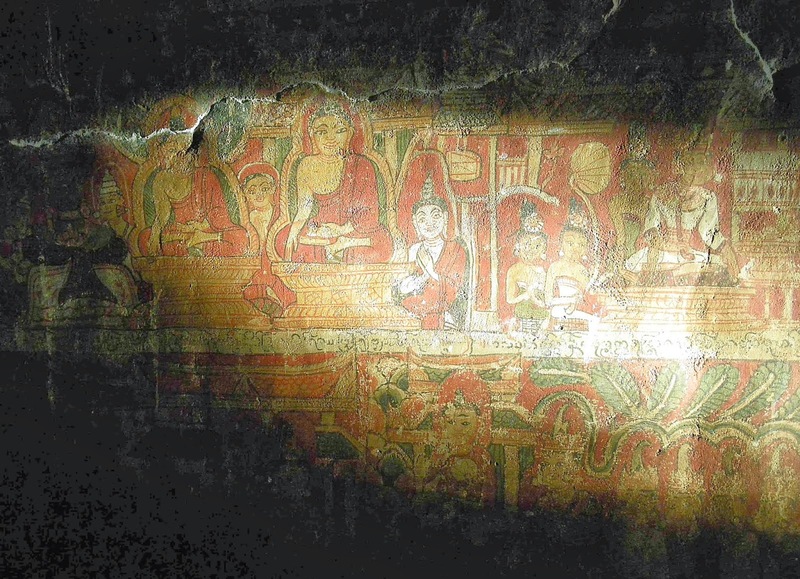 Dating to the 1600s, the temple-cave had been damaged by fire. However many of the paintings remain as if they were painted yesterday, displaying vivid blues, reds and golden yellows. Exploring the chambers and corridors by torchlight, we were astonished by the detail and impeccable condition of the images, amazed that they hadn’t been ‘caged’ off limits like some many others we’d seen in Bagan. Most were traditional designs and stories of the Buddha’s life. But the best was yet to come. As J, Naung Naung and I were in one of the deeper, darker areas, suddenly we found ourselves bathed in light. Curious, I walked to the source and discovered where the light was coming from. A monk and caretaker of the cave had set up a series of mirrors. One was placed outside in the direct sun, angled in such a way to reflect the light into the cave. Another mirror was placed strategically inside the cave to catch the first mirror’s reflected light and relay it further into the depths of the cave. As we moved through the passages, the monk adjusted the mirrors’ angles to shine light into where we were. It was truly amazing! 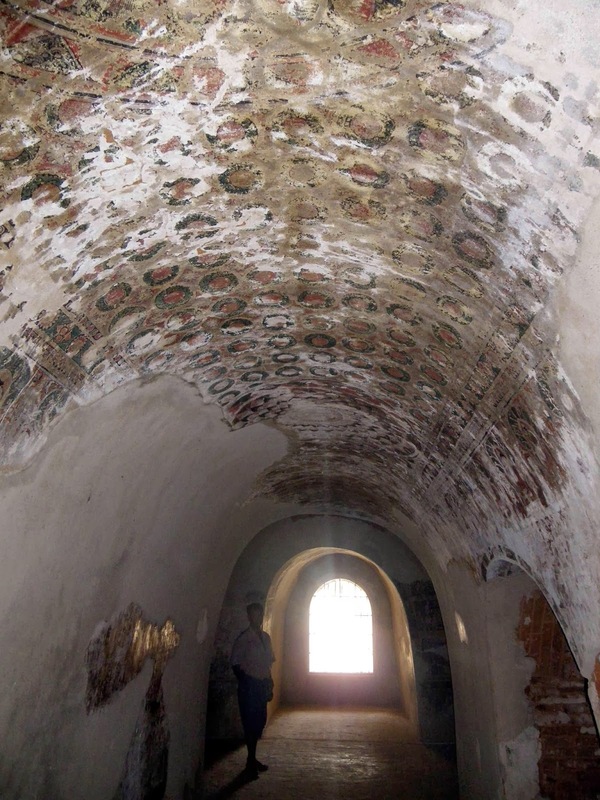 The colours of the frescos were bright when viewed by torch, but illuminated by the mirrored natural sunlight, the yellows appeared like gold; the blues metallic; and the reds glowed. We could see wires hung along the roof line of the cave, where it appeared they were intending to install electric lights. J and I commented that they shouldn’t, as nothing would compare to seeing those stunning artworks by sunlight. Stairs lead to an upper level, where some windows had been caved in to let in natural light. But the paintings that would have once decorated those walls were all but faded. This was our favourite site in Sagain, and the whole of Mandalay, and we took time to explore and examine it, relishing the cool shade inside the cave. Naung Naung had never been there and beamed happiness, excited that he had a new excellent site to bring future customers of his taxi service. With folded hands, I thanked the caretaker and the other man before we continued on to the Sagian hill area and its many temples and pagodas. 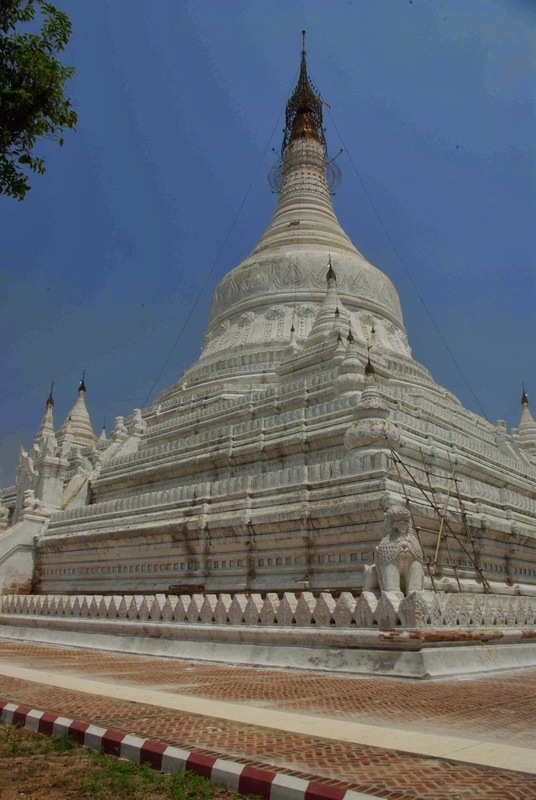 Near the top of the hill, the first stop was Umin Thonse pagoda, who’s name means ’30 caves’. It refers to the semi-circle temple building with 30 doorways, interpreted as ‘caves’. 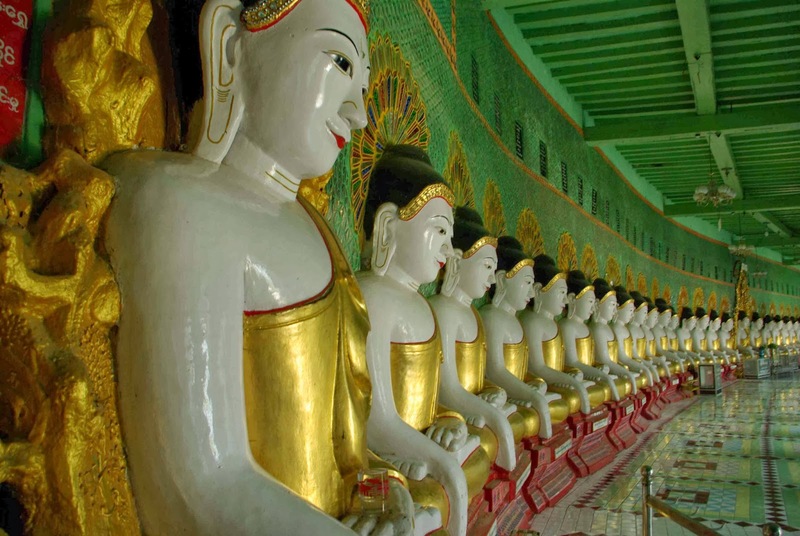 Inside, 45 identical Buddhas sat in an arc, with white faces and golden robes. Behind the main temple were a number of other shrines and buildings dotted further up the hillside. Suckers for punishment, J and I headed up a few stairs up a level. A group of young locals were also visiting the area and we exchanged smiles and greetings with them. Being a temple, we all had removed our footwear, so all suffered the same fate - the super-heated concrete and tiles. In some places, the tiles were light coloured, tolerable under foot. In others, dark red tiles felt like walking on burning coals of fire. We scampered between shaded sections exclaiming yips and yells as we felt the molten heat of the tiles, laughing with each other as we each reached cooler areas. The interesting statues and temples up the slope were worth exploring, as was the magnificent view. Once at the top shrine, we groaned having to re-run the hellish heat of the walkways. Finally returning to the car, we travelled a little further along the ridge to the Soon U Ponya Shin paya, the top of Sagain hill. 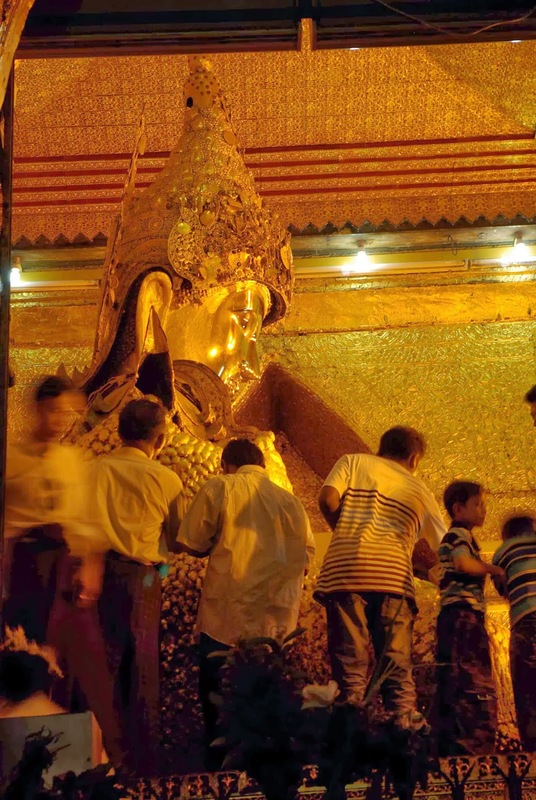 It is the oldest on the hill, which had dozens of other gold temples dotted among the trees. The central gold stupa was ringed by shaded corridors, the patterned tiles mercifully cool for our scorched feet. 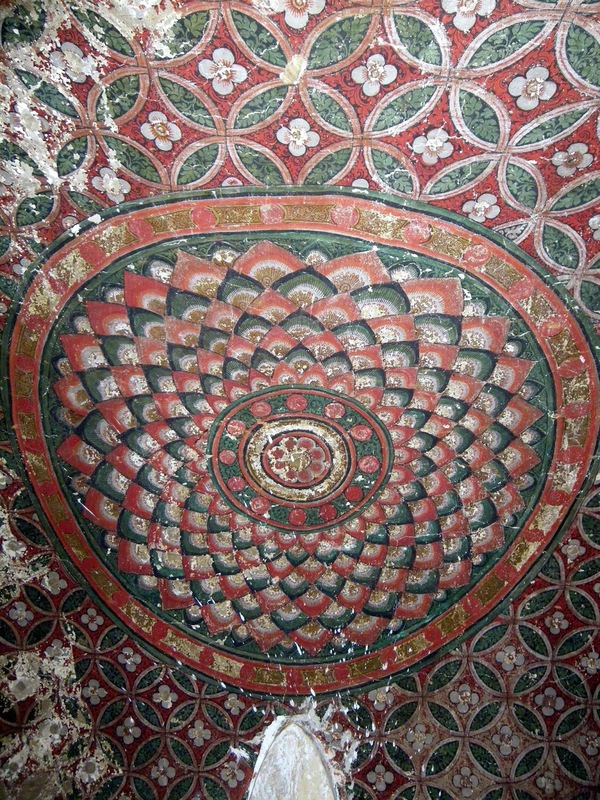 Below the ceiling line, colourful paintings told tales from the Buddha’s life, as well as stories about the local kings. 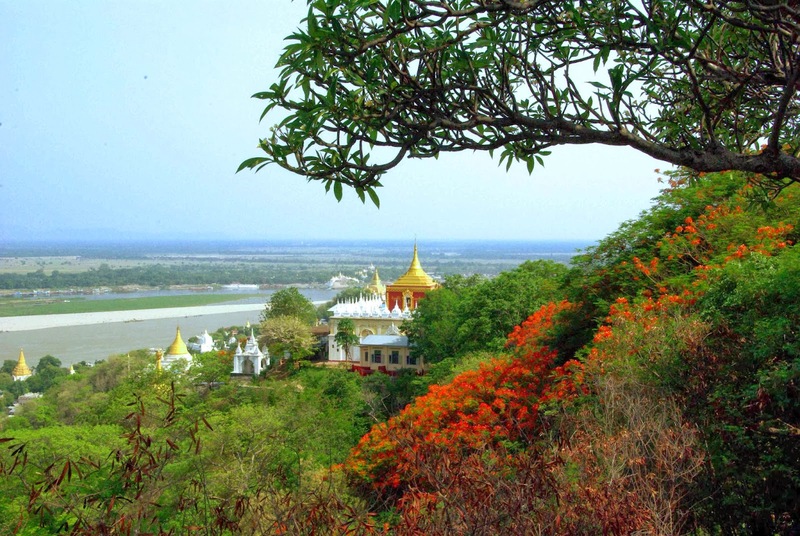 Many alcoves provided lookout spots overlooking the hundreds of hundreds of stupas, temples and shrines with the mighty Irrawaddy river cutting a track through the scenery in the distance. Under the various terraces, we enjoyed the view accompanied by some cooler breezes. While I was taking photos, a young monk approached, greeting us confidently in English. Soon we were chatting about our families, homes, jobs and the weather. He asked us to help him with his English producing an exercise book. Pages of neat writing attested to his studies. Turning to a new page, he asked us to repeat our names while he carefully wrote them, along with our home town, country and date. Handing the book and pen over, he asked me to add a note in the book. I just wrote a message of encouragement for him to continue his studies in English, but also the Dharma, signing it with a wish for his happiness. Our next stop was not on my list to see, Ava, or Inwa. Having read about it being a tourist trap from other travellers, I thought we could miss it. 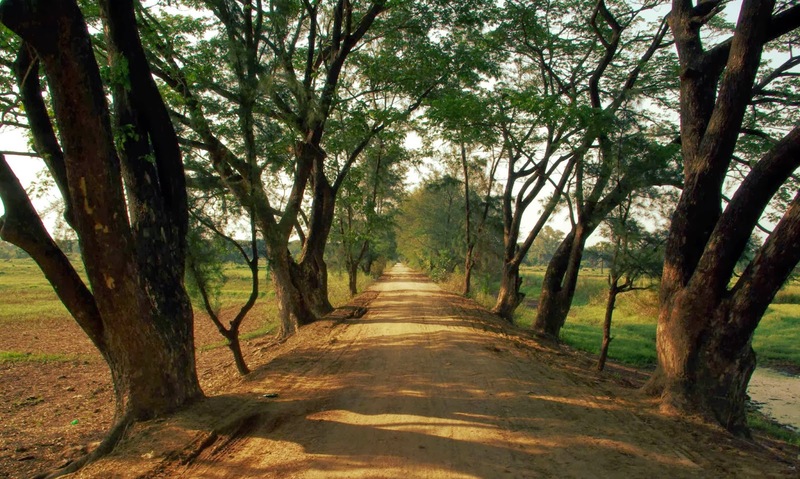 Driving towards it in late afternoon sunshine through a picturesque landscape, I thought we were arriving at U-Bein bridge. Two young girls, one maybe six and her younger sister about three, met us as we got out of the car, and didn’t leave our side. Naung Naung gestured for us to buy tickets for the ferry, which were only 800 kyats each, and to wait. Our two girls then proceeded to dangle jade necklaces and trinkets in my face, stating we had to buy from her. “No much people, you must buy. I have no money”. J bought a cold water from another vendor near by. So the oldest girl set on him to buy me a gift. Saved by the boat from the persistent girls, we wondered down the hardened mud bank to the makeship boat jetty. 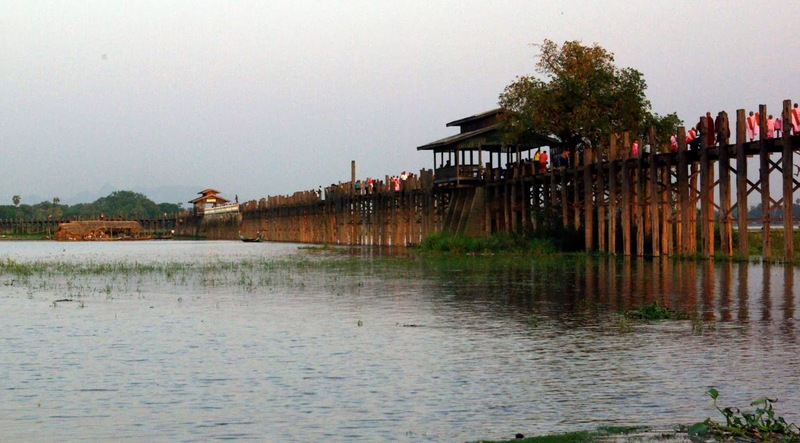 As it was still dry season, the river level was low, leaving the regular jetty metres above the water. The short trip over the Myittha canal to Inwa island took only a few minutes. At the other side, we were met with a few stalls and a group of horse cart drivers, all vying to take us around. Without too much thought, we just grabbed the one closest, paying him the fixed fee for the trip to the main sights. 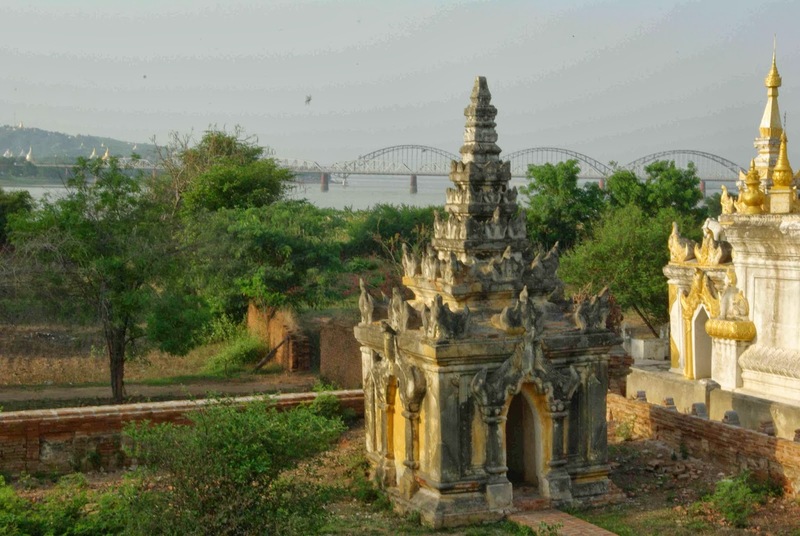 Inwa was an ancient ex-capital of Myanmar covering periods of hundreds of years, on and off. 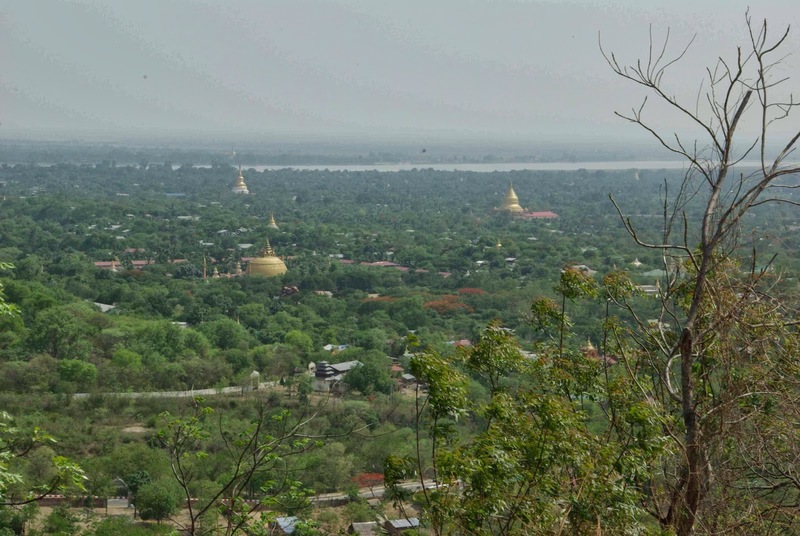 During its reign, the whole of the north of the country near Mandalay was known as the kingdom of Ava. Nowadays it’s just another rural farmland, with bullock carts and rice patties. Much like the carts in Bagan, I sat on the back while J sat with the driver. Catching glimpses of the old city walls through the trees along the way, our first stop was the Bagaya teak monastery, the noted main point of interest. Unfortunately, we were stopped from entering as we needed the Mandalay tourist zone ticket to enter. J and the driver had a cigarette while I roamed around and took some shots of the lovely surrounding fields. 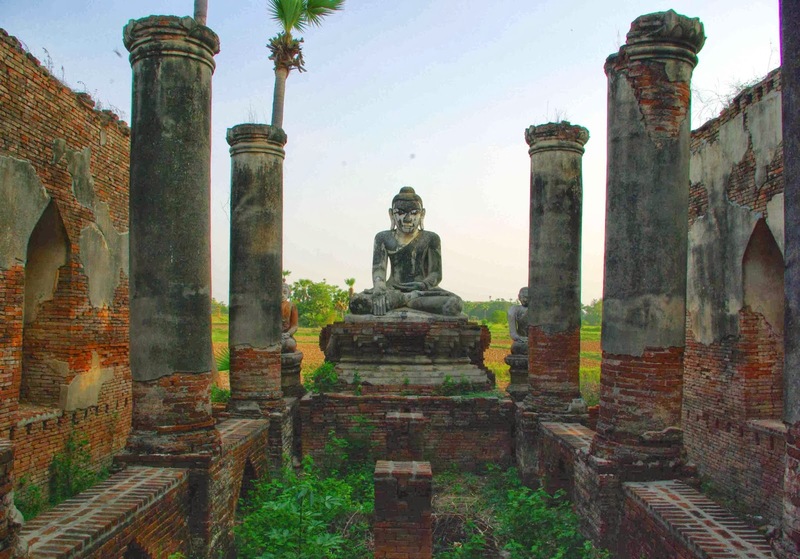 The remains of Yadanar Semi Pagoda were our next stop, which I enjoyed the most for it’s photogenic ruins and lone Buddha sitting in the midst of the roofless temple columns. Red brick stupas and white-washed Buddhas around the small complex were very much like the temples we’d seen in Bagan. Picking up the speed of the horse cart as we rode through the pastures, we passed the old Nanmyin watch tower. Though interesting, our driver informed us it was closed. He stopped at a vantage spot to allow us to take some photos of the whitewashed tower, which looked a little rickety and unstable. Maha Aung Mye Bonzan monastery was our last stop. 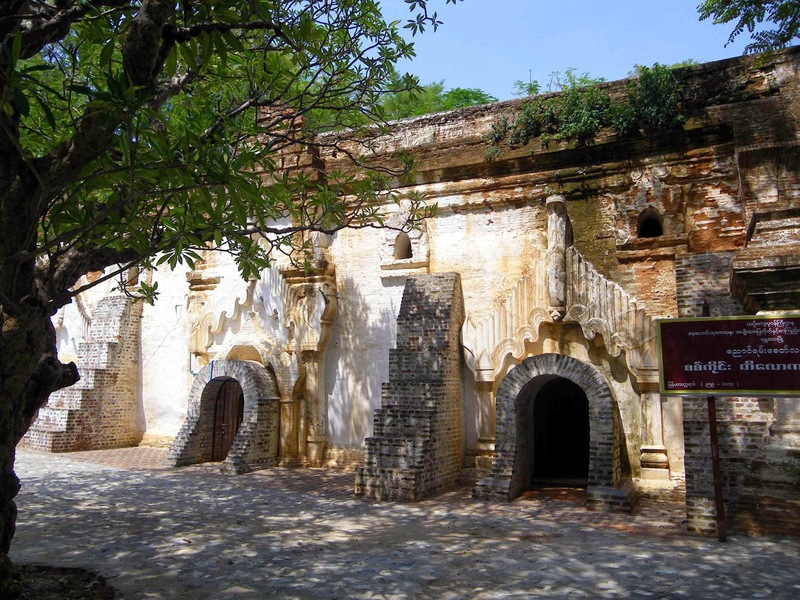 Unusual for the time, it was made of brick and stucco, not the typical wood like so many others of the era and area. Damaged by earthquakes, it still stood in good condition. Seeing us arrive, a teenage girl joined us. She lead us through the small compound, trying her best to speak all the English words she knew to explain the features of the building. Chatting with her for a few mintues, we let her finish and explored the exterior terrace that offered some nice views to the river. Persistent, she simply wouldn’t leave us be. Sure enough, as we returned to the cart, she asked for 10000 kyats. Way too much. Though not much to us, it was an outrageous request, so offered her 4000 as that’s what I had readily on hand. She took it with a rude expression and jumped on her bike to follow us in the cart yelling and asking for more money. It was an awkward moment. We were happy to be heading back to the boat to return to Naung Naung. Alighting from the boat, the girls were waiting for me. “Ok. Ok. Now you must buy from me. 4000 kyats”, she smiled dangling a necklace before me with a large jade stone in its centre. As we walked back up the boat ramp to the car, I bargained with her. Finally, she made me a deal too good to refuse, 1000 for her and 1000 for her sister. Bargain. Lucky J had a few loose notes in his pockets. With money in her hand, and tip, she said her cheeky thankyous before running off. Sunset wasn’t too far away, so we hurried to U-Bien bridge, not too far away. 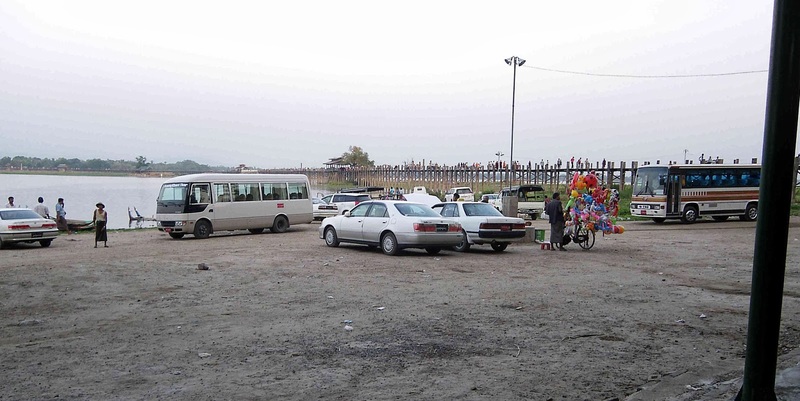 A few mini vans and cars were parked along the river shore in front of a small set of restaurants. With a festival of colourful balloons, in almost every shape and design, a lone vendor pushed his bike up and down the car park hoping to make some sales without much success. Lucky for us, there weren’t too many other tourists. I could only imagine what a circus it would have been in the peak season. Only a small group gathered in a pavilion closer to the water’s edge ahead. Not so lucky for our poor balloon salesman. 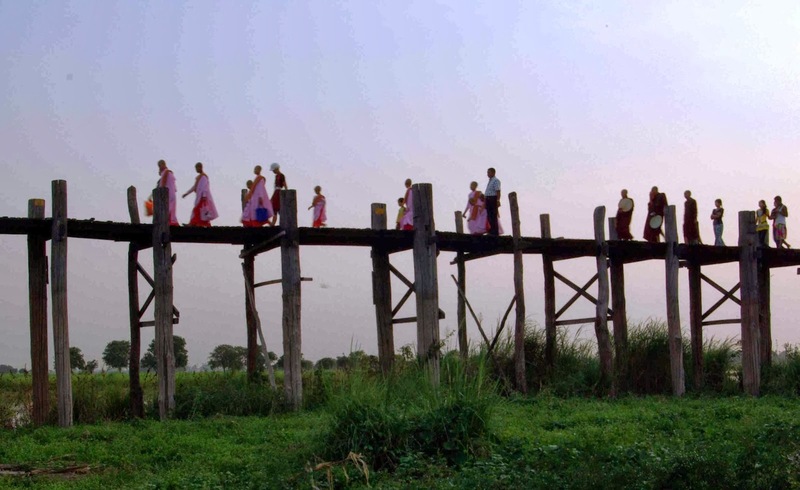 Stretching as far as the eye could see was the famed teak bridge. Under its upright posts, a marshy/grassy reserve provided a good place to set up my tripod to take shots, moving between a few different spots to try to catch good light. Above, a steady stream of foot traffic made for a ever-changing scene. To the side, small boats were offering trips out to see the bridge from other vantage points but J and I were beat. I was content just taking a few photos. Looking back now, I regret not going out on a boat or even up to take a bit of a walk along the famous bridge. Oh well, a good excuse to go back one day. Many locals were relaxing in the shady cool of evening. Picking one of the restaurants with the most comfortable looking chairs, J and I sat down, quickly ordering a couple of cold beers. It seemed we started a trend, with some other visitors also deciding to come over and have some drinks and snacks. People watching as the sun set over the laid-back setting was the perfect way to end our whirl-wind day of sightseeing. i would really appreciate if you could tell me what is manageable in 10 days and how to plan my trip, what to watch out for.